suicide watch ten times -- so often that he had developed a taste for the instant coffee in the hospital visitor’s lounge. they asked him why. they gave him pills. dr. musell even tried to cognitive behavior techniques. but he wanted out. he knew that. they suspected something was wrong with him, but he knew they were the ones who were blind. eternity was there to be seized. no more work or desire. eternity without pain and sadness, without jockeying to be at the top. if he could get out, he could join the flow. but they always stopped him. the cars swerved out of the way, the rope broke, the pills were placebos, the bullets went straight through. they were trying to hold onto him, and he was not sure why. he had nothing for them except for energy. this time he would take someone with him. tandem jumping. so simple. 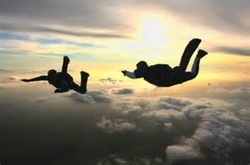 go up, wait for the door to open, stab the tandem guide, and free fall into eternity. he didn’t expect to meet sheila though, she was his guide and was also the most beautiful transsexual he had ever known. they hit it off right away, and she was all he could think about during the fall, so after it, he asked her to dinner, and they tripped easily from there into love. for three months, they lived in bliss, surprising each other. sheila would show up at his place wearing only a long coat, or he would wait in bed for her all day so that when she came home, he could surprise her. he began, however, to grow overzealous. he wanted her all the time, and the pressures of earning a living, eating, and staying in shape began to seem like distractions. he knew that if they went into eternity that they could spend all their time together without worrying about their physical needs. so for their fourth month date anniversary, he asked her to set up another tandem jump. this time, he wanted to face her body on the way down. she thought he had some sort of romantic plan, so she said yes. right when they jumped, however, he started to stab her with his knife. in the process, his arm caught on ring and pulled the chute. the jostling from its opening made him drop the knife. when they touched down, he blacked out, but he knew right away when he woke up that sheila was dead. there he was by himself in a prison cell. he soon found out that the newspapers claimed he hated transsexuals and had just lead her on to kill her brutally. he was horrified, and he could see no way out. he had nothing with him. he had no pills. he had nothing dangerous, but he realized that he was dangerous on his own. so during his outside time, he jumped on a guard and started trying to bite his ear off. another guard shot him in the head.